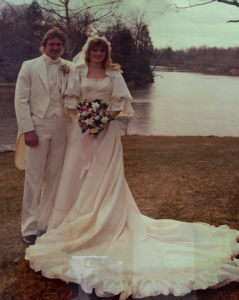 On Tuesday, April 16th, Glenn and Beverly Kafka celebrated their 30th Wedding Anniversary. If it wasn’t for their union, Kafka Granite would not be the successful family owned and operated business it is today. Soon after her boyfriend had started his own business in 1979, Beverly Starzinski switched her course of study from fashion merchandising to business administration, in hopes that her skills could be supplemental to Glenn’s new start-up. On the weekends and during the summer, Bev would often come home from college and help Glenn work in his new decomposed granite pit. The day Beverly graduated from University of Wisconsin-Stevens Point, Glenn had proposed. Less than one year later, on April 16th, 1983, they were married in Glenn’s hometown of Stratford, Wisconsin. Beverly was one of Glenn’s first employees, and she soon learned that marrying an entrepreneur wasn’t a very lavish lifestyle. Every morning before the sun came up, Glenn and Beverly would head to work. While Glenn was off bidding road jobs and searching for new raw material, Bev would load trucks in the quarry and do paperwork from her car. Early on, Beverly has memories of standing on the crusher on Easter Sunday. Nearly everyday for about 7 years, Beverly would come home with dusty, dirty hair and without a paycheck, all in hope that her husband’s new business could someday be a success. As the company grew, Bev was soon able to secure an office job, where she managed all of Kafka Granite’s administrative functions. In conjunction with the growth of the company, Beverly’s responsibility has increased significantly. Although she is often behind the scenes, her strong character and work ethic have been instrumental in building the company to what it is today. While growing a successful small business, Glenn and Beverly also raised two children: Christopher, 26, and Tiffany, 21. With their parents’ support and guidance, Chris and Tiffany have both found passion in the business, and are actively involved. Kafka Granite is positioning itself to continue into the next generation. Congratulations on 30 years, Glenn and Beverly! Click here to read Kafka Granite’s full history. As a past recipient of the Wausau Region Chamber of Commerce’s Small Business of the Year award, Kafka Granite would like to congratulate all of these year’s winners. On Tuesday, RMM Solutions was announced this years winner in the Business to Business category, while Young’s Drug Store won the Business to Consumer title and Boys and Girls Club of Wausau was awarded in the Charitable Non-Profit category. Five to six businesses competed in each of the three categories, where they were judged on their company story, business growth, community involvement, and innovative efforts. The Small Business of the Year awards are a part of Wausau Region Chamber of Commerce’s Small Business Week, in which the community celebrates small business in the Wausau area. Small Business Week festivities include a legislators lunch, open house, awards breakfast, product exposition, luncheon, and other networking events throughout the week. Click here to learn more about the Wausau Region Chamber and how you can become involved! The umbrella of Kafka businesses has grown! We are proud to announce the addition of Kafka Biomass, a new business that will service the We Energies/Domtar Biomass Energy Plant that was recently built in Rothschild, Wisconsin. In the fall of 2009, Domtar and We Energies announced their plans to build a 50-megawatt biomass-fueled cogeneration facility on the Domtar property. Domtar has utilized biomass in the past to generate steam for their paper-making process, but the new facility allowed Domtar to retire all their old boilers and the increased output of biomass energy nearly eliminates the use of natural gas. In addition, the new facility reduces overall emissions by 30% and has created new jobs for the local community. 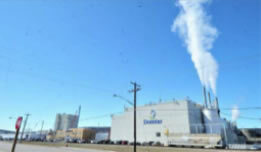 The new plant is positioning Domtar to be more competitive in the global marketplace. Kafka Biomass has entered into an agreement with We Energies to provide a remote biomass storage facility for the Domtar plant. Kafka Biomass will scale, inventory, store, and deliver between 40,000 and 80,000 tons of clean wood waste each year. In addition, Kafka Land Clearing will serve as a supplier of clean wood waste, which is generally brush and stumps from land clearing or shavings and sawdust from manufacturing facilities. Click here to learn more about the Biomass Energy Project.